In the heart of Clifton Forge, about a half hour west of Lexington, is the historic Masonic Theatre. Up until 1987, the Masonic was the oldest operating theater in Virginia. It reopened in 1990 and was donated to the town of Clifton Forge in 2003. The architectural masterpiece has hosted such stars as Gene Autry, Tex Ritter, Burl Ives, the Drifters, and the world-famous Count Basie Orchestra. 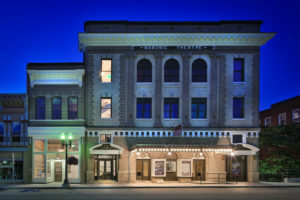 In 2016 the theatre turned 111 years old, and remains a vital part of the Clifton Forge community thanks to the work of the Masonic Theatre Preservation Foundation, formed in 2009. The group’s mission: turn the three-story, Beaux Arts brick building theatre into a performing arts, entertainment, education, and community facility. Virginia Community Capital provided significant financing with a historic tax credit bridge loan, in addition to the support of Virginia Community Development Corporation (VCDC) and People, Inc, US Bank. Department of Housing & Community Development (HUD), Alleghany Foundation, and contributions from residents.